Dr. Jeffrey G. Karam’s interdisciplinary and innovative approach inspires a new way of thinking. Dr. Karam giving a talk at the Middle East Initiative at Harvard University’s Kennedy School of Government in 2018. (Harvard Photos/ Benn Craig). In our current era of social media saturation and the proliferation of “fake news,” reinforcing critical thinking and informed citizenship is especially important. 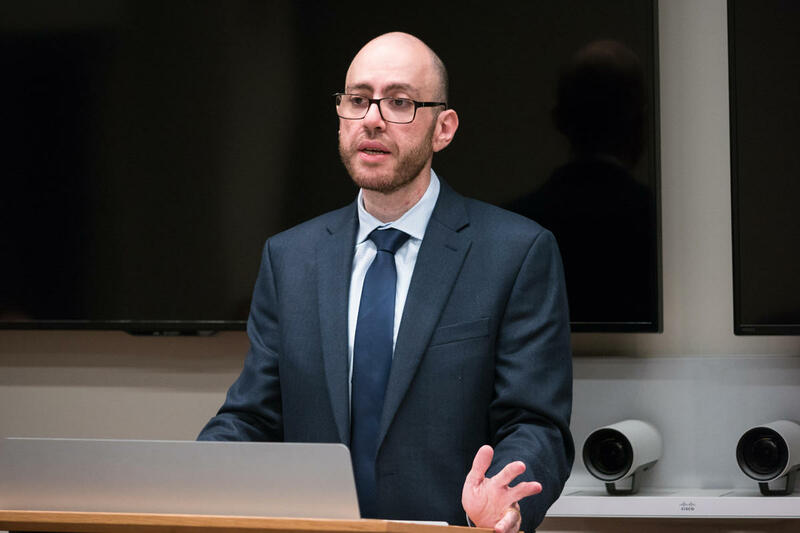 That is why Assistant Professor of Political Science and International Affairs Dr. Jeffrey G. Karam emphasizes these points to his students using his preferred interdisciplinary and innovative pedagogical approach. Dr. Karam joined LAU in August 2018 from Harvard University, where he was a postdoctoral research fellow and is currently an associate. He is an avid researcher with a special interest in the politics of intelligence and foreign policy in the context of US-Middle East relations, the subject of his first book, which he is currently finishing. Recently, he has been conducting extensive research on the newly digitized personal archives of Lebanese General Security Founding Director Emir Farid Chehab – nearly 1,900 documents in all – released by the Woodrow Wilson International Center for Scholars in Washington in September 2018. He published a short analytical article on the Chehab Papers in The Daily Star and was interviewed by Carnegie Middle East Center’s Diwan on the importance of such archives. He also wrote on the recent formation of the Lebanese government and what the Lebanese should expect in the coming months for The Monkey Cage, an independent blog hosted by the Washington Post. On this recent article, Dr. Karam mentions that “it is important for scholars to bridge the gap between policy and academia by producing crisp, clear, and sharp analytical pieces on contemporary developments.” In June 2018, he was selected to participate in Bridging the Gap’s International Policy Summer Institute, a week-long professional development program for scholars to produce policy-relevant academic research at the American University in Washington, DC. In his classroom, Dr. Karam says he aspires to motivate students to seek primary sources in their research and to read documents that are accessible online as a way of breaking the prevalent culture of conspiracy theories. To that end, he organized a workshop in fall 2018 during which students were trained on how to sift through declassified US intelligence documents. It is one way for students to verify the various narratives that they hear about Lebanon’s past, Dr. Karam explained. “An archive is like a common path for public knowledge. We are not going to have a balanced account of our history until we find a consensus on what it means to write about facts and not opinions,” he said, referring to the lack of a unified history curriculum in Lebanese schools. On the importance of providing students with a platform to communicate their ideas in a clear way: “If they can’t relate what they learn to their job later on, what use is it to them? So my classes and different active learning exercises are basically a walk to the past but a very fast sprint to the future,” he said. He also redesigned many courses – such as Foreign Policy of Major Powers and Concepts of World Politics – to be more of an active learning experience, including “casual Fridays” in which students engage in critical discussions on progressive topics such as gender, race, international relations, and climate change. The result, he reports, is that in class and in workshops, students are growing more inclined to the idea that they can read outside what their family tells them and should always be critical of what they read. Dr. Karam is currently teaching a new course that he designed, Security Studies: Theory and Practice, which is the first of its kind to be offered at LAU. One of the course’s requirements is that “students write a research paper they will present during a conference that we will have at the end of the spring semester. It will be a student-only conference in which they will communicate their ideas to the wider community, ” he said. Similarly, last semester he organized a simulation crisis on global climate change in which students represented the five permanent members of the UN Security Council. Each team outlined strategies and memoranda on the issue of global climate change and ways to respond to this international security threat. It was a successful experience that, he said, will be repeated at the end of spring 2019. Dr. Karam strongly believes that such exercises prepare students for job interviews and for giving presentations in an effective and coherent manner in a short amount of time. He is also keen on revisiting pivotal periods in the region with a fresh perspective. One such project is his involvement as editor and contributor to the forthcoming book The Middle East in 1958: Reimagining a Revolutionary Year. The volume covers the Middle East during that transformative year in which Syria and Egypt formed the United Arab Republic, Algeria was immersed in a revolutionary war against the French, while France witnessed the birth of its fifth republic following a constitutional coup and revolution. Also that year, the United States replaced Britain as the new powerhouse in the Middle East.